Home / UncategorizedBeautiful Pooja Room! 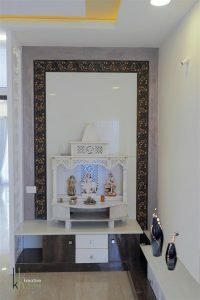 This Pooja room designed by #kreativehouse reflects the sincere devotion. This room has a beautiful feature wall made of tiles with an intricate pattern on it’s borders that blends well with the exquisitely carved lattice design of the marble temple as seen in the worship houses of Lord Krishna, Ganesha and Sai Baba. A few drawers beneath the prayer platform are a practical addition that help store pooja supplies, they are covered in brown and white laminate and blend in perfectly with the rest of the house.